Happy Halloween, peeps! I hope everyone is celebrating safely and happily. We are having an unusual Halloween this year. We’re moving to Sweden today. Which means it’s our last day as residents of the Netherlands. As such, I’ve written up a little goodbye. Amsterdam, it’s been real. You have been an incredible home to us for the past 14 months. You have opened our eyes to new experiences that we never could have imagined. Thank you. And thanks for all the amazing memories that we will cherish forever. It has truly been a pleasure. You will always have a special place in our hearts as our first home away from home. You can see my first impressions here. The movers are here! This time they have a permit to be parked in the street; we’re off to a good start. (When we first moved in, they didn’t, and had to park at the end of the street and carry all our stuff down the street by hand.) As they begin to pack up our things, I figured I should stay glued to the computer as long as possible share some impressions from our second visit to Stockholm, just two weeks ago. While our house hunt was a bust (and still is), we otherwise had a really great visit getting to know our new home. The dining scene is fantastic, as we expected from our initial culinary adventures. This second visit cemented it. The Swedes really care about food (like me) so this will be a good bonding point for us. With dinners at trendy AG and swanky Riche, we were impressed. We tried some local dishes and loved them! Skagen is basically a cold shellfish salad on toast, so good. We also had Isterband, which is a pork sausage with potatoes and beets. Reminded me of corned beef, also delicious. And Biff Rydberg, fried tenderloin chunks that comes with a raw egg yolk to mix up with potatoes and horseradish creme. Yum! We have heard that it’s more common to host dinner parties at home than eat at a restaurant, but I’m pretty sure we’ll be doing our fair share of both. The city as a whole feels huge. It’s roughly eight times bigger than Amsterdam, geographically. We’ll be getting to know that public transportation system real quick. Walking from our hotel, Nordic Sea, to Södermalm took me over 30 minutes. I can walk across the entire city of Amsterdam in that time. Despite this leap in size, each island/neighborhood feels small and cozy. 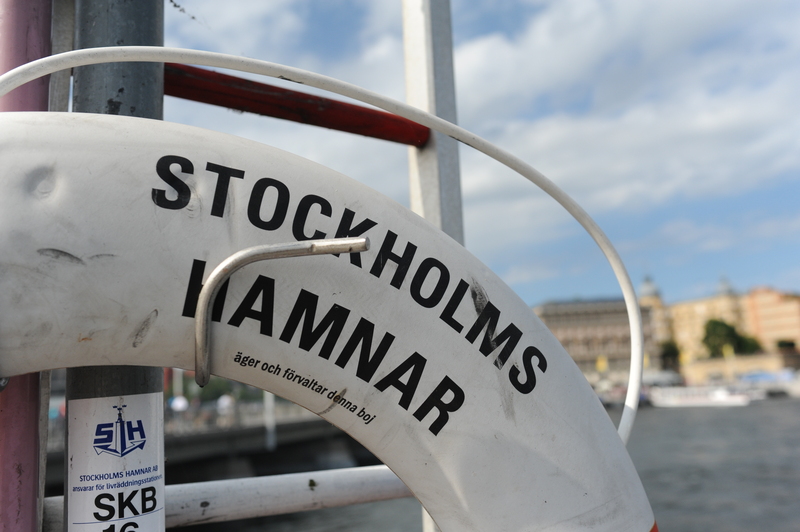 After several more days of wandering around, we still love Södermalm the most. It feels the most “us”, as the Pijp did here in Amsterdam. It’s cold. I was not surprised by this as I do not live under a rock, but I was surprised by my body’s very averse reaction. …And it was just October. I have really got to develop a thicker skin for winter (either that or invest in some thermal tights). I’m from Chicago for goodness sake. You would think I can handle it. To make it worse, everyone has warned us that we are moving there at the darkest, coldest, wettest, ugliest time. Yay. Can’t wait. Really though, we’re okay with that. Because it will only get better… right? We found out about cool celebrations that are totally unique to Sweden. Midsummer in June with dancing under the midnight sun and crayfish parties in August where you better take gulps of schnapps are just the beginning. The Swedes live the good life. Enough chatter. It was a quick trip and much of it was spent on the house hunt, so we didn’t have a lot of free time. Here are a few pics. Both visits, we noticed we haven’t taken the best pictures, so I apologize for that. These don’t really do Stockholm justice. It is a really beautiful city. Hey friends. 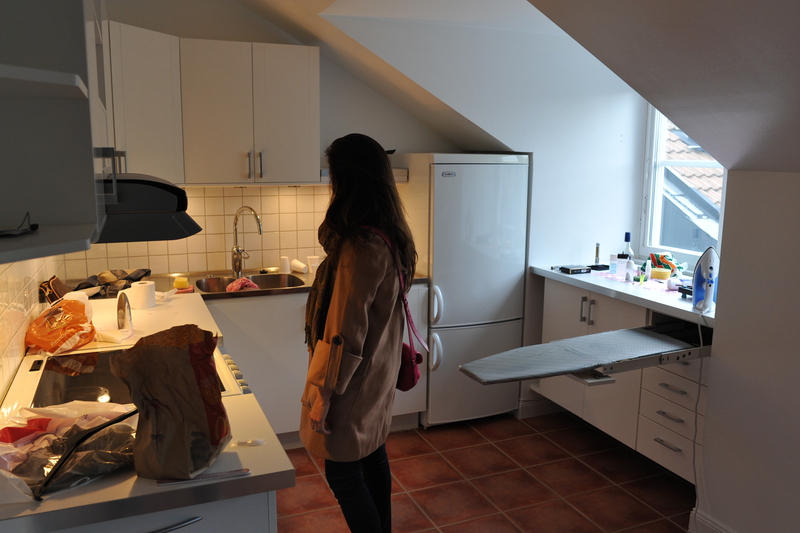 We got back from our Stockholm house hunting trip last night. I’ll spare you the suspense: It was a big BUST. We did not find a home that was suitable for us. After examining seven apartments in total, we just could not commit. 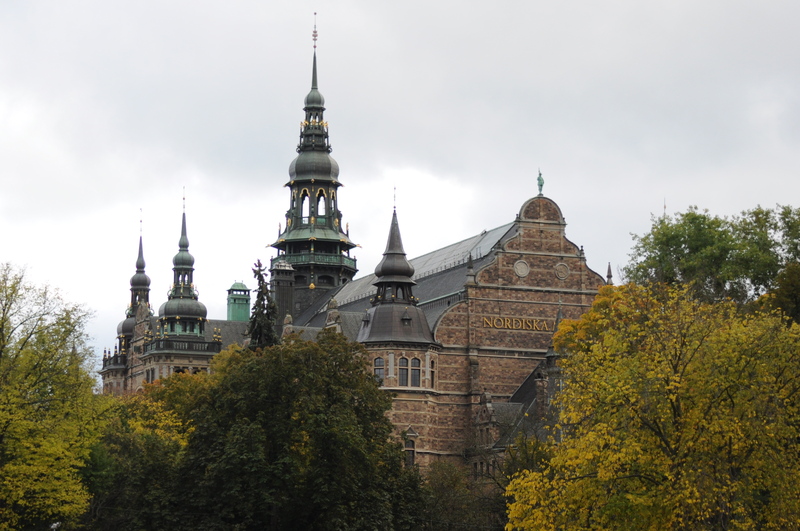 Prior to this house hunting trip, we had visited in July to understand the city a bit, done lots of research on the neighborhoods, scoured Swedish online resources about apartments both for sale and for rent. All to get a feel for the market and what to expect. Let’s just say that in an expensive city like Stockholm, we set our expectations at an all-time low. 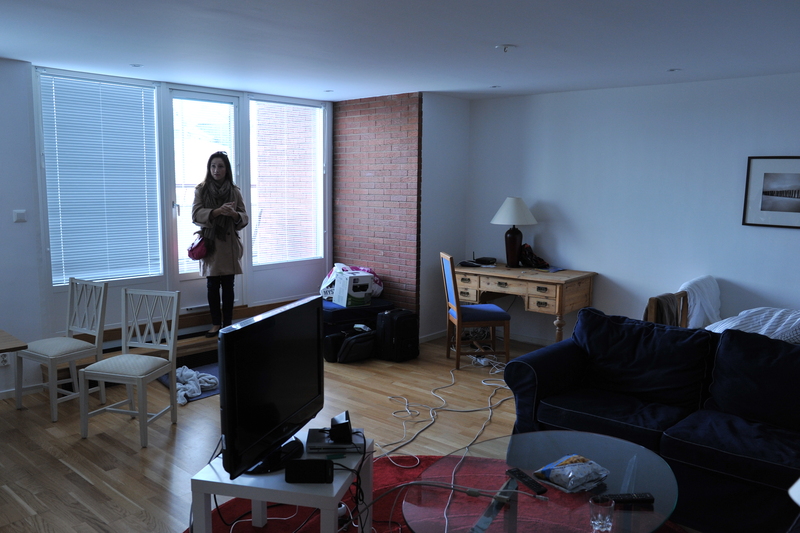 For comparable rent to our Amsterdam pad, we needed to sacrifice both size and amenities. Now that makes me laugh. Those of you that have visited or seen our Dam apartment know that we’re spoiled. It’s huge. 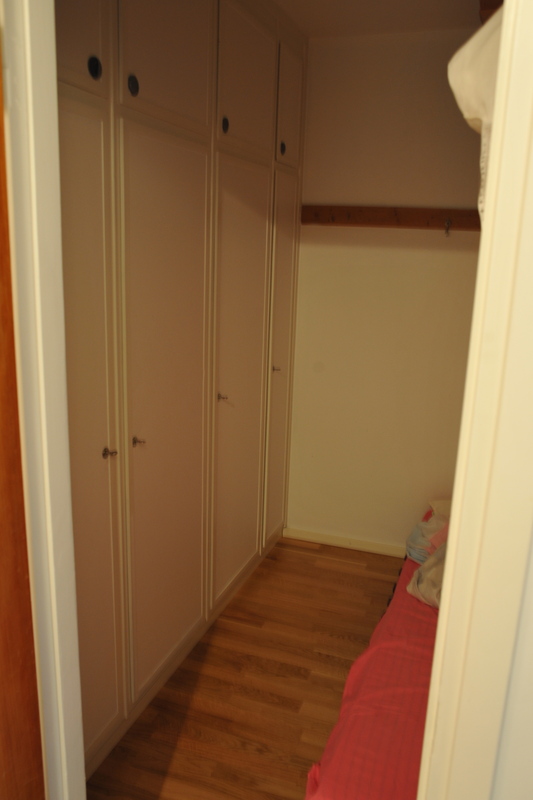 Probably close to 150 square meters. We have a dishwasher, in-unit laundry, gas stove, two bedrooms, two bathrooms and pretty much a dance floor/bowling alley. It has been the perfect place to entertain; hosting visitors, throwing parties and nice dinners was our favorite. We also have fantastic neighbors, our street is lovely and we are near everything. It’s actually the best. First of all, I cannot believe how some people live. I’ll try not to make this a generalization about all Stockholmers, but we saw several apartments that were absolutely disgusting. Don’t they know strangers are going to be inside their place hoping to rent it? It was almost impossible to see past all the trash and clutter. Case in point, kitchen #1: It’s a good thing you can’t see my face. Not all Scandinavian design is beautiful. 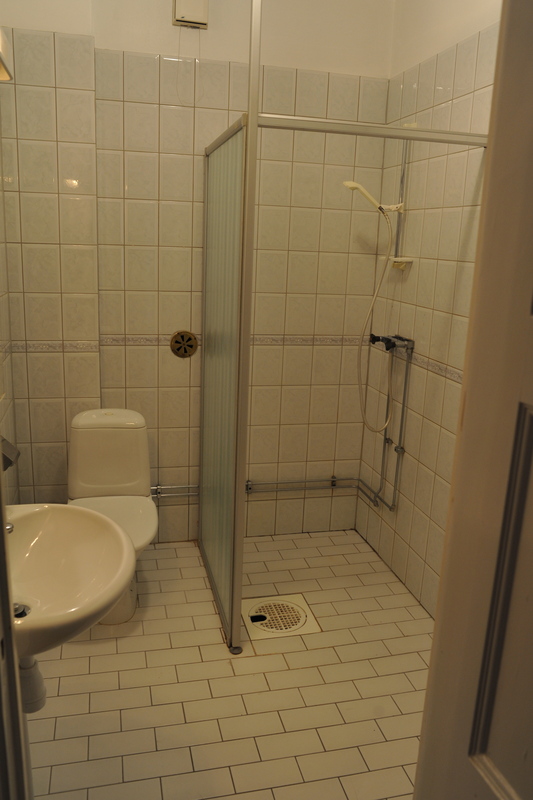 Case in point, bathroom #3: There is no way I would shower in there. It looks like a shower you get murdered in. Some bedrooms are actually not. Case in point, spare bedroom at #4: Where the naughty kids are sent to bed. You don’t have to set it up the same way as the current tenants. Case in point, living room of #5: What on earth is going on here. We only saw one nice apartment we could see ourselves living in. Meatloaf may have said two out of three ain’t bad, but one out of seven is really bad. Terrible. The deal breaker was that it sat on the northern edge of town, in a quiet area full of families with small kids. We aren’t there yet (and won’t be for several years, thankyouverymuch). While we know we have to sacrifice size and location, we won’t budge on location. We want to be in a lively ‘hood. So what now? Time to face reality. We have to increase our budget by about 5,000Kr. We have to be flexible about “nice” amenities like dishwashers, in-unit laundry, balconies and, most sadly, spare bedrooms. We have to keep looking. Come November when we head over for good (oh God, two weeks from now! ), we’ll be in temporary housing until we find it. It will be worth it. It’s all just taking a little longer than we hoped. Hi pals. Happy Monday. I hope you all had a nice weekend. We went out with friends on Friday, met friends for lunch on Saturday and stayed in that very rainy night with pizza & beer. We’re really enjoying these last few days in Amsterdam, rain or shine. So, Stockholm! We’re moving there in two weeks. If you’re reading “live”, we are there. Right now. To house hunt! Okay, more like tiny apartment hunt, but still. I hope we find our little home. But let’s back up. If I’m going to do this right, I have to go wayyy back to July when we first visited. We went for five days, smushed between hosting visitors and our two week trip to Italy. To say we were a little frazzled (or maybe that was just me, Jaro tends to take things in stride better than I do) is an understatement, especially because this trip was booked only the week before. It all felt rushed and I felt unprepared. I hadn’t researched much about it and wasn’t sure what to expect. As we arrived, I have to admit… I did not want to like it. I love Amsterdam. I’m not ready to leave. It really feels like home and a place I could stay for a long time (read: more than the 14 months we’re getting). I love our neighborhood, our lifestyle, our friends, our apartment, everything. Okay, maybe not the weather, but even that has stopped bothering me like it first did. Our focus of this trip was to get an “overall feel” for the city; explore some different neighborhoods, see where people shop, eat, hang out, etc. So we rode the T to our teeny holiday apartment in Södermalm, the alleged bohemian neighborhood (much like Amsterdam’s Pijp where we currently live), and I had my doubts. I was ready to point out all its flaws and shortcomings. As I stared up at high-rise condominiums, modern glass buildings, and so much concrete, I wasn’t feeling it. I missed Amsterdam’s charming, cobblestone streets. It’s very stylish. Shopping is a huge part of the culture and the city’s somewhat recent rise to fame, something which Amsterdam is not exactly known for. While I have happily adapted to the Dam’s casual street style, I’m going to have to step it up a notch with this move. And no complaints! I love fashion and even though my passion took a hiatus for the years that I was an accountant, I think it’s really going to come back in full force. It’s hilly. Whoa. I have never lived in a place with actual hills. I love the added interest it gives to the city landscape. It’ll make walking and cycling a better work out, that’s for sure. Speaking of interesting landscape, this city is comprised of 14 islands all connected by 50 some-odd bridges. Smitten! They eat lots of herring (and fish in general), much like they do here in Amsterdam. But theirs is pickled, not raw. I still like it. They eat lots of other delicious things too. Chutney, Urban Deli, Bageriet by Urban Deli, Restaurang Östgötakällaren, and the many others we tried, were all great. Good food, friendly service. I know the culinary scene is going to rival (and maybe beat?) Amsterdam’s. Swedish wildlife (as we learned at Skansen) includes brown bears, coyotes and wolverines! Neighborhoods are all very different. We only checked out parts of Södermalm (hipster), Gamla Stan (historic), Norrmalm (touristic), and Djurgården (green space). On this current visit, we’ll also see Kungsholmen (residential), Östermalm (posh), and Vasastan (residential) during our apartment hunt. There is a lot to explore. It’s expensive. Beers can be up to €8. A one hour T fare is about €5. And trying to convert the Kronor back to Euros is dizzying. It took several months to start “thinking” in Euros instead of dollars, but I think we’ll get used to our new currency faster in Stockholm. Bonus Thought: I like saying that we’ll be living in Scandinavia. It just sounds cool, yeah? Much like how I love saying we have been living in Holland. Sigh. Enough talk, here are some pics. We surprisingly didn’t take a lot because we were so busy trying to soak it in and not be too distracted by what aperture setting we were using. Moving is tough. Not going to lie, it’s stressful to visit a new country, trying to imagine yourself settling in there. In many ways, you can’t. We were more than ready for the initial move to Amsterdam just out of sheer excitement (I’m riding a tram! I’m eating herring! This is all so exciting! ), but we are a little more cautious about this one. We hope we love it just as much. And you know what? I think we will. So there you have it. Some initial thoughts on Stockholm. Looking forward to sharing our house hunting adventure with you all soon. Woo wee! Man, it feels good to finally let the news out that we are moving to Sweden. I wish Jaro had more time to contribute to the blog. What a sweet post, right? He is the best. That’s why I married him. This has been in the works for months. To be honest (because I always am on here), it was a slow, painful process that kept us wondering if it really was a good idea. Most of the time, we were frustrated by delays and problems that were out of our control. The rest of the time, we were frustrated with our own anxiety about this decision. Now that it’s all over and the contract is officially signed, we feel a huge relief. Time to get excited. It looks like we’ll be moving around the beginning of November. In the meantime, we have already begun the torturous process of immigration and all the paperwork that goes with it. Yuck. It’s all too familiar as we were faced with this mountain of to-do’s just one year ago. As with our move to Amsterdam, this is another permanent relocation. And by permanent, I mean we’ll stay there until another opportunity presents itself. We don’t know how long that will be. And we’re okay with that. Like I said in my homesick post, Jaro and I are a team. We share all our excitement and hesitations, talk through every decision (big & small), and chose this new path together. There was a lot to consider, trust me. Making this transition will hopefully be much easier than the first time around. We’re pros at being expats or “foreign migrants” now. However, having each other is good and all, but also having an amazing support network is helping us tremendously. We know we have the unwavering support of our families and friends. As cryptic and vague as we’ve been for the past couple months, everyone has been so patient and understanding as we’ve navigated our next step. Thank you. This decision has not been easy, but all of your support has helped us be less frantic. And yes, we did visit Stockholm in July. Obviously, I have LOADS to say about it. And I have loads to say about wrapping up this year in Amsterdam. So many thoughts, you guys. I’ll be sharing that soon. Right now, we are setting off on an epic road trip. We decided this… yesterday. We don’t know where we’re going (though we do have some ideas). We don’t know when we’ll be back (though we know it will be within 2 weeks). All we know is that we’re cranking up the Stones, throwing caution to the wind, and hitting the road. We’re off on an adventure. Yet another. After a long stretch of uncertainty, the setting for the next chapter of our adventure has finally been decided, officially bringing a conclusion to this first year of life in Europe. We are moving to Sweden. In a little over a month we’ll be packing up our Dutch life and moving north, to the beautiful city of Stockholm – home to picturesque Scandinavian landscapes, IKEA and some of the world’s tallest (and most attractive) people. We paid the city a top secret visit before our trip to Italy and found it suits us very well. We know we’re going to miss Amsterdam but we leave knowing we’re going to love Stockholm. It’s another beautiful European city with it’s own unique character. And though the people are a wee bit shorter and the population is just a tad smaller, Stockholm certainly feels BIGGER than Amsterdam. And in many ways, it is. It’s spread over an archipelago of 14 islands and much of its architecture is based on the grand buildings of Paris. Julie said it reminded her of Vienna. We both felt that some parts even reminded us of sweet home Chicago. So what is taking us there other than the meatballs? I’ve accepted a new opportunity with Nike as Running Brand Manager for Stockholm. Working on running will be a great new challenge for me as it is the sport at the company’s core. But I’m probably more excited about that last part, Stockholm. Notice it’s Stockholm and not Sweden. For now, I’ll get to focus on a city. Not a territory, not a country, but a city! And a great one at that. But the best part is what it means outside of work. Julie and I have had an unbelievable but difficult year. We had the perfect wedding followed by the perfect honeymoon then we uprooted our lives in Chicago to start our life together in Europe. I spent half the year in Ukraine, most of that without Julie. I won’t get into how stressful it can be trying to get things done in Ukraine. Add on an ambitious personal travel schedule and you’ve got one year that takes the toll of five. Though we did a lot together, Julie and I had very different experiences. We spent a lot of time apart. I never had a chance to settle in and really feel at home. The new job is, more than anything, an opportunity to take a deep breath and slow things down. Sure, I’ll work just as hard as I always have, but I’ll be in one place, dealing with first-world problems. I couldn’t be happier that for the next indefinite period of time I will find myself, very comfortably, located in a city, with my wife. Exactly where I want to be.